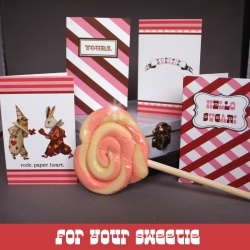 Send off your love and sweet wishes to 20 of your closest pals and loved ones....this set comes complete with 20 mini valentines and 20 matching glassine envelopes. Glassine envelopes have a flap to close (but does not seal). 2. Rock. Paper. Heart. -- this design is lightly embellished with glitter! But wait! There's more! This fabulous set comes ready to go in a mini white lunch pail. Whoa, that's cool! And the lucious lolly is for the photo only. ***** © The Paper Princess, LLC/Leslie Saito All copyright and reproduction rights are retained by the artist. Original illustrations by Leslie Saito.